Al Colegio en Bici (Bike to School) trains children on bike safety and maintenance, organizes escorted bike caravans and distributes bikes and accessories, all with a goal of encouraging bicycle commuting among the next generation. To win trust from parents and students, this inter-departmental program takes a no-risk approach and engages residents at every step. And the results go beyond sustainable transit. Individual children take pride in bike ownership and maintenance. Parents come out to support the convoys, and are more likely to report crime affecting the commute. Older children serve as mentors and trainers and lead cross-neighborhood excursions. And there are new constituents advocating for city bike lanes. 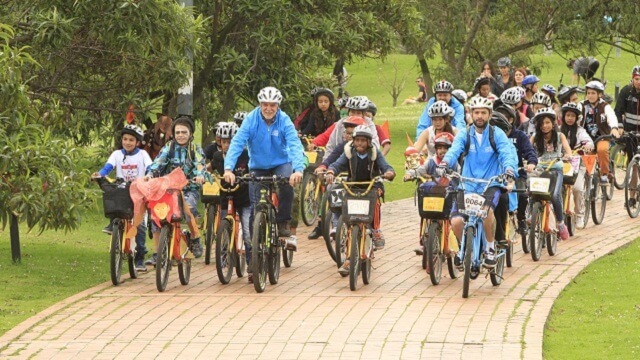 Al Colegio en Bici (Bike to School) is a joint project of Bogotá’s Education and Transportation ministries, with an aim of encouraging sustainable student transportation. It began in 2013 but has been championed and expanded by the subsequent administration, which took office in 2016. The basic premise is that public-school students complete ‘Bike School’ and then join escorted bike convoys riding to school on designated ‘trusted routes.’ The Bike School curriculum covers basic riding and maintenance skills, traffic rules, road safety and environmental impact. Some program graduates are eligible to receive a kit of accessories and a new bicycle. But program managers knew that a bit of training wouldn’t be enough to win over parents and school administrators, particularly in the blighted neighborhoods where the program could have the greatest impact. “There was a lot of skepticism in the beginning,” Project Coordinator Leonel Miranda said. Engaging parents and neighborhood residents at every step of planning for, operating and maintaining safe streets. In short, the organizing of safe commutes was not left to chance, and this is where elements of citizenship and community-building come into play. The program includes a second phase of Bike School, in which city officials evaluate the school environment and designate ‘trusted routes’ to and from school. Bike caravans are organized and accompanied by fluorescent-clad road-safety officers from the Transportation Ministry’s GUIA group. After school and on weekends, bike clubs and group expeditions are organized to support additional community-building. By the end of 2016, approximately 3,000 students were reportedly biking to school using Al Colegio en Bici routes, logging an estimated 650,000 trips—the equivalent of 120 school buses. In 2017, the city expanded the program from six to 12 districts with an injection of new funding, setting a goal of 6,000 participants by the end of 2019. Many more children receive training in road safety—more than 20,000, according to the mayor’s office. In 2017, 1,000 program participants also received donated helmets through a partnership with the Automobile Club of Colombia. Beyond the numbers, the program appears to have had positive effects on individual and community development. Children are taking pride in bike ownership. Older students have become mentors for younger ones, teaching bike-safety classes and leading group excursions. Student convoys have been able to ride through areas that were considered dangerous for individual children to walk through. Parents are involved in watching and supporting the convoys, which has increased the reporting of crime incidents affecting the commute. Bike excursions have built connections across neighborhoods, and the program has stimulated additional investments by the city in bike lanes and bicycle parking spaces. One of the participating neighborhoods, Bosa, is the planned site of the city’s first Bicycle Center, which will offer training in advanced mechanics and entrepreneurship. Al Colegio en Bici extends the government’s responsibility for students beyond the schoolyard and the school bus. Asked about convincing officials to take on these risks, Project Coordinator Leonel Miranda said "You do not have to be afraid of innovations, but you have to take risks.” In practical terms, the program took a legalistic approach, developing contracts with participating families that clearly spell out lines of responsibility. Inevitably, accidents happen. In 2017, a 10-year-old student lost control of his bike due to poor road conditions and was killed by a truck. An Al Colegio en Bici guide had dropped the boy off at a meeting point but when a family member failed to meet him, the boy began cycling home alone. News coverage of the event, while documenting the family’s belief that many parties were to blame, noted that family members were obligated to pick him up and that the tragedy was the first accident in approximately 1 million trips under the program. A bike-to-school program could be viewed as a relatively modest pedagogical and/or sustainable-transit investment with high public-relations value. But Bogota officials present the program as one piece of a larger puzzle, one that contributes to entrepreneurship, community cohesion in disadvantaged neighborhoods, citizenship culture and equality. It has been planned and implemented accordingly, with a long gestation period, a footprint across departments and mayoral administrations, and a thoughtful, deliberate approach to community involvement. This provides a strong foundation for building outward from the program, whether it’s the Bicycle Center or additional transit and community-development work that draws on the Al Colegio en Bici constituency. The national Safe Routes to School (SRTS) program seeks to humanize traffic safety while shifting stakeholders’ focus from particular intersections toward broader network improvements—building a safety culture within government. SRTS is a core strategy for Vision Zero LA, the city’s initiative to eliminate traffic deaths by 2025. The city has partnered with the LA Unified School District to encourage communities to prioritize children and youth pedestrians and bicyclists through safety improvements and slowing traffic speeds near schools. The Play Everywhere Challenge, an initiative of the non-profit organization KaBOOM!, challenges cities to incorporate play into unexpected places while engaging communities in reclaiming and developing public spaces. Case studies include the iPlay Miami Streets project, in which local artists painted children’s games on the pavement of dead-end streets; Playful Gardens in Tucson, Ariz., where residents painted road intersections and walls so that the path to school is safer and brighter for neighborhood children; and OX4D Plays, a project in Houston, Texas to paint games and art pieces on well-trafficked surfaces at a public-housing complex.